Imagine you have bowled just one over and have conceded 13 runs in it. The part-timers have to fill in the remaining overs and there you are, the captain throws the ball at you to bowl the most important six balls of the game- the 50th over. But, as they say, opportunity comes wearing clothes of adversity, and it up to you how you approach it. 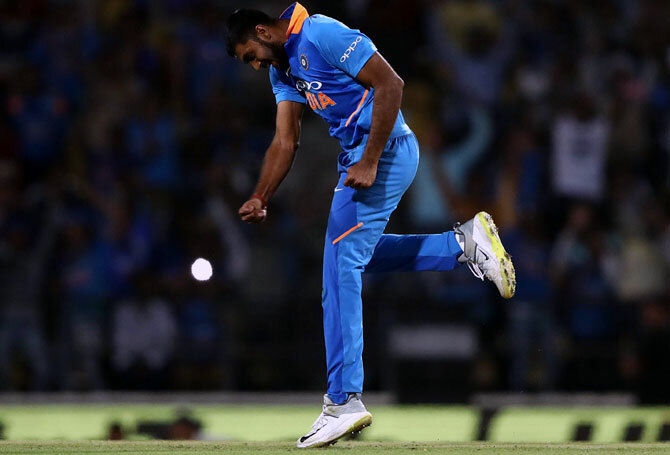 Vijay Shankar, at Nagpur, was certainly at up for it. As he had done with the bat [46 off 41 balls] earlier in the day, Shankar optimized the opportunity thrown at him to successfully defend 11 runs off the last over to bring up India's 500th win in One-day cricket. Requiring 11 runs off the final over, Shankar accounted for the dangerous looking Marcus Stoinis with the first ball before knocking over Adam Zampa. On a tricky wicket, Australia looked well poised at 5-218, requiring just 33 runs from 34 balls, after Stoinis and Carey had taken on Kuldeep Yadav in his last spell. But, Yadav clean bowled Carey in his last over to initiate the collapse that saw the visitors lose their last five wickets for 24. Bumrah once again displayed why he is the best death bowler going around as he clean-up Nathan Coulter-Nile before having Pat Cummins caught-behind to turn the tide significantly in India's favor. Australia got off to a good start to their run-chase with Aaron Finch  and Usman Khwaja  notching up 83 runs for the opening wicket. But, as has been the pattern with Australia, all of their batters got in and found a way to get out against the run-of-play. Finch perished to Jadeja while Khawaja was deceived by a loopy delivery from Kedar Jadhav and closed the face of the bat way too early, to give a simple catch to Kohli. Glenn Maxwell was bogged down by incisive bowling from Bumrah and Kuldeep, scoring 4 off just 18 balls. In trying to break the shackles, Maxwell was cleaned up by Kuldeep to bring Marcus Stoinis to the crease. 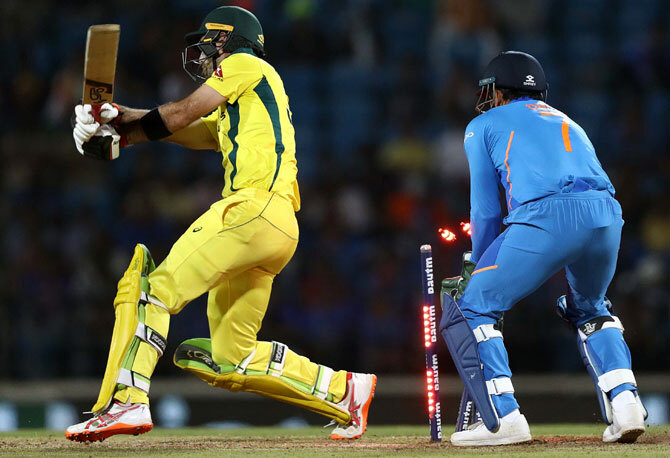 Kohli missed a trick by bringing in Jadeja and Jadhav when Kuldeep was clearly troubling Stoinis, allowing the all-rounder and Carey to buckle down and stitch a crucial 47-run stand which eventually proved to be futile in the end. But, Jadeja made his presence felt in the field as he ran out Handscomb with a throw of pin-point accuracy. It was a tricky wicket to bat on, where chasing was always going to be difficult. And, it was vindicated early on in the Indian innings. Skipper Virat Kohli was the difference with the bat. The Indian captain, en-route to his 40th ODI ton, once again showed why he is far and away the best in the world. He showed his immaculate ability to adjust to the conditions- technique as well as his ego, to held the fledgling innings. At 3-51 after 17 overs, Kohli found an able ally in Vijay Shankar. Shankar looked the best of the Indian batsman today, playing some delightful strokes off Zampa (Read: down the ground), Coulter-Nile (Read: on-drive) before pulling off a flat-arm jab, one that would have made his captain proud. But, just as he looked set for a big score, disaster strike. Kohli played a full-blooded drive off Zampa, which ricochet off Zampa's hand to the stumps, finding Shankar short of the crease. Shankar's wicket caused a mini-collapse as Zampa claimed Jadhav and Dhoni off successive balls to reduce the Men in Blue to 6-171. But, Kohli managed to hold fort along with Jadeja to take the score past 230 and bring his 40th International ton in the process. Kohli's wicket in the 48th over eventually was the difference between India getting 250 or 260+, but thanks to Australia's penchant for collapse and immaculate bowling by the bowlers- capped off by Shankar's last over, it didn't prove to be decisive in the end.